The Micromax Canvas HD is a gorgeous phone with a white back panel and a black front with an attractive shiney chrome bezel. The Micromax Canvas HD comes loaded with Android 4.1.2 Jelly Bean OS out of the box. It also comes with Google Play and bunch of other Google applications. Google Now which comes bundled with Jelly Bean OS is also pre-installed on the phone. A bunch of pre-installed Micromax applications can also be found. The Canvas HD is powered by a powerful MediaTek (MTK MT6589 Chipset) 1.2 GHz Quad Core Cortex - A7 Processor. It has 4GB of internal Memory. The device also has a micro SD card using which storage can be expanded up to 32GB. Canvas HD is a Dual Sim phone (GSM+GSM). 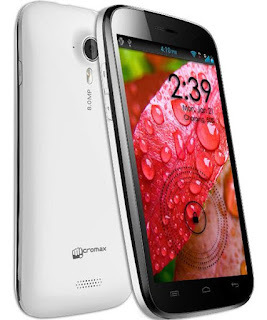 The Micromax Canvas HD (A116) is priced RS. 13999/- and is no doubt one of the best budget smartphone.